“The weather is wonderful—very warm, can be hot, with a sprinkling of showers every once in a while. Coming from our cold temperatures in Canada we appreciate not having to bundle up for five months,” says Colleen Tannahill who, along with her husband Blake, owns a condo on the Caribbean coast of Mexico. Colleen and Blake were born and raised in Saskatchewan, Canada. Both from humble backgrounds, Blake was a cabinetmaker for 35 years and Colleen was a stay-at-home mother. It was when they retired in 2013 that—like many other folks—they decided to look overseas for a property investment. Mexico’s Caribbean caught their attention. With some of the most picturesque white-sand beaches on earth, turquoise waters that lap on quiet shores, and nearby Mayan ruins, Colleen and Blake found what they were looking for. “Having not been to Mexico before, we decided to go to the Riviera Maya—Tulum in particular—to check out the area. We fell in love with the beach, the jungle, the locals, and of course the warm weather,” says Colleen. Colleen and Blake decided on an overseas property as an investment…and in an area that’s a perfect place to buy and rent out their condo. They bought in a master-planned community in Tulum—a luxurious location just a short bike ride to Tulum town and Tulum beach. These are the closest condos to the beach and to a newly planned center of cafés, galleries, and boutiques. “We wanted to buy a property overseas because we felt that having a rental property that could give us some extra cash would be a good investment for us,” Colleen says. “This investment has turned out to be a good decision. We purchased our condo for $169,000. We were really happy with the service we got—having people you are comfortable with and trust is so important when you are buying in a foreign country. A major benefit of Colleen and Blake’s investment is the time they get to spend there. “Our time here is spent in total relaxation,” Colleen says. “We do what we want when we want. A favorite thing to do is take day trips to different places in the area. 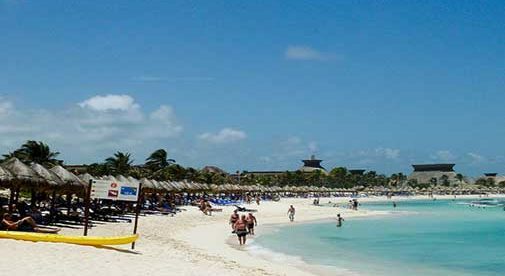 Our day trips have included the Coba Ruins, a monkey preserve, a fishing excursion, Cancun, Playa del Carmen, and a trip down the coast to Majahual for a five-day stay.